Why Do it? : Sowing wildflower seeds in your garden is a brilliant way to attract wildlife! 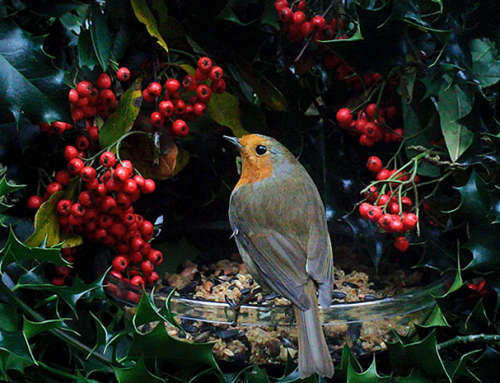 Seedballs are an easy and convenient way to add a wildflower patch to your garden. Sowing wildflower seeds in your garden is a brilliant way to attract wildlife! Seedballs are an easy and convenient way to add a wildflower patch to your garden. 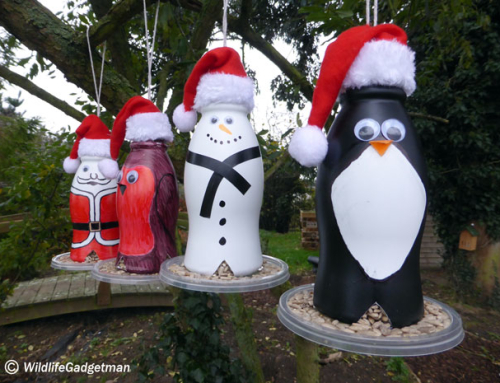 This project utilises recycled materials that you probably have laying around the house. If you don’t then no doubt family or friends will! 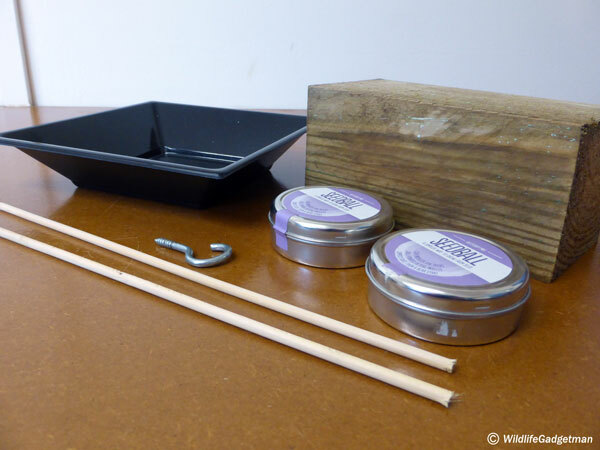 All you need is two empty Seedball tins, a 200mm length of 3×3 post, a suitable disposable plastic party plate (you could even use appropriately sized ready meal containers), two bamboo BBQ skewers and a hook. 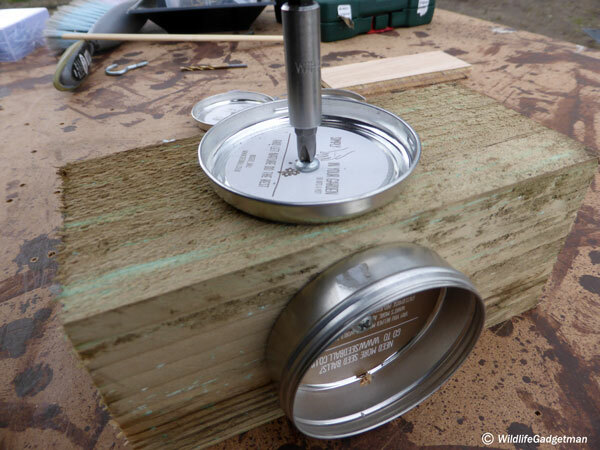 Drill a hole in the centre of the lid and base of each tin. 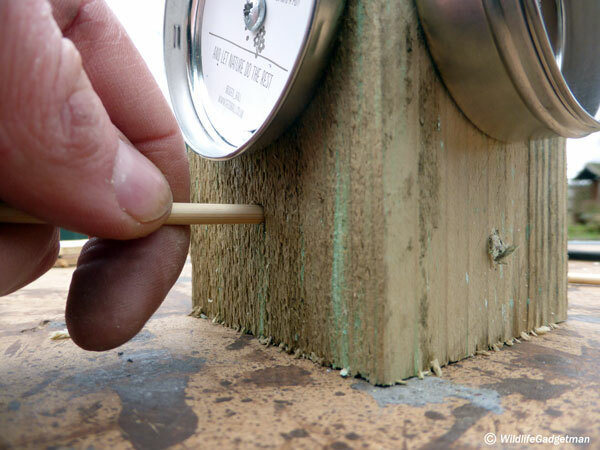 Fix each half of the Seedball tins to each side of the length of post. Be as creative as you like with positioning. Measure the diameter of your bamboo BBQ skewers. 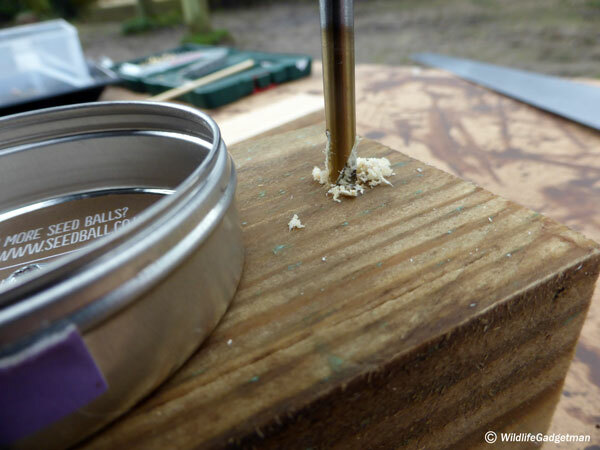 Drill a slightly larger hole right through the post just below each pair of tin halves (See image above). 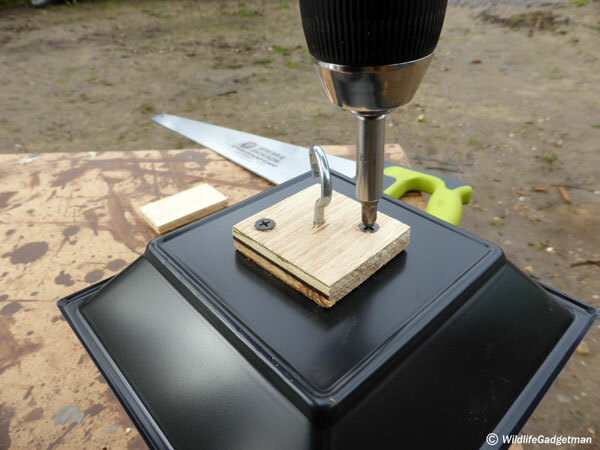 Drill one hole slightly lower than the other so you will be able to push the BBQ skewers right through in the next stage. Cut the BBQ skewers to a length of 220mm. 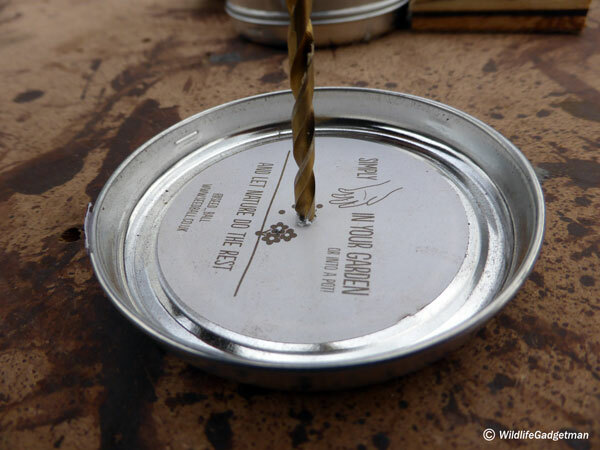 Push them through the holes to create the perches below each tin half. 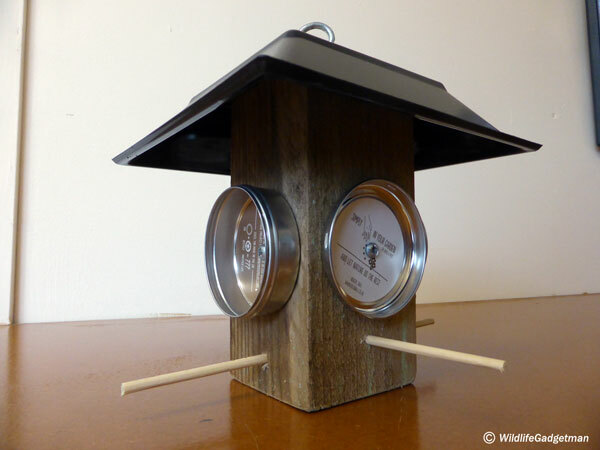 Use a scrap of wood and a couple of screws to fix the roof to the feeder base. Fix the hanging hook in the centre. 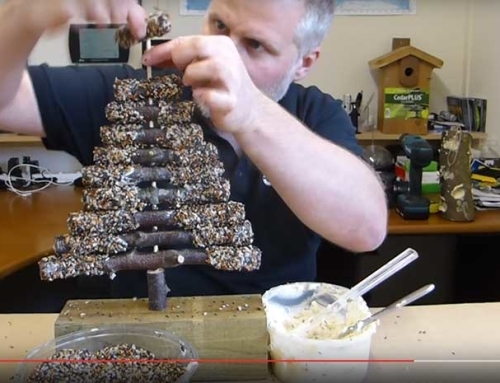 Construction of the feeder is now complete. 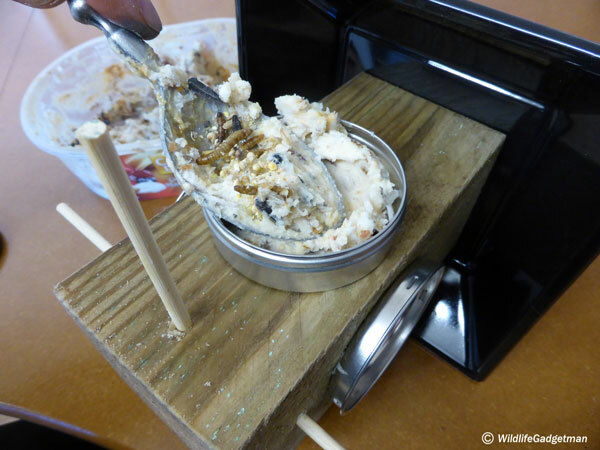 Time to move on to mixing up your fatty treat to fill it! Mix your fat treat mixture! Feel free to experiment with this but I use five parts vegetable fat to one part unsalted peanut butter. 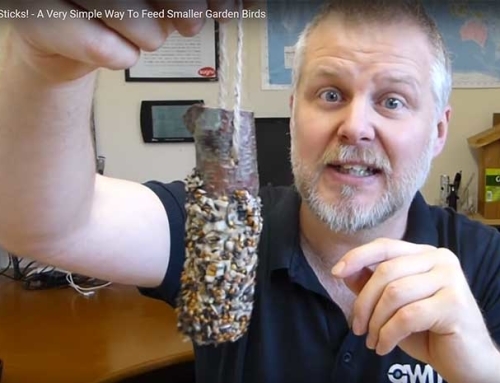 I then throw in some kibbled peanuts, dried mealworms and a hand full of general bird seed. Now take your mixture and fill each of the tin halves. 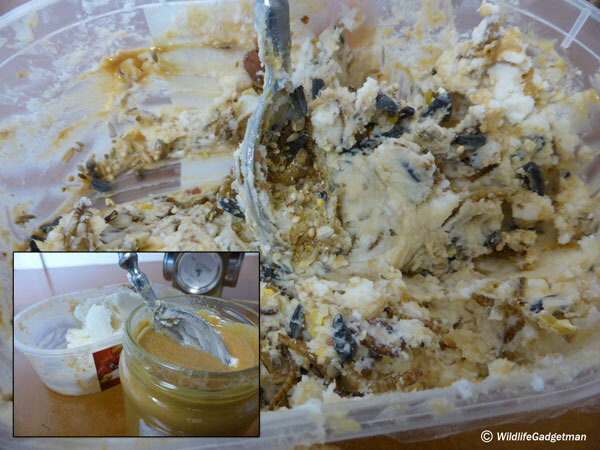 I usually mix up my fat mixture in an ice cream tub. If there is any left over just pop the lid on and store in a cool dark place. 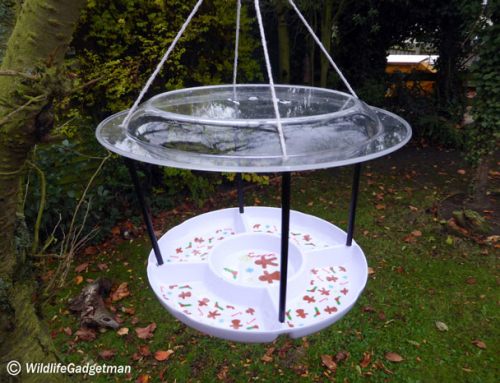 Hang your new feeder in the garden! 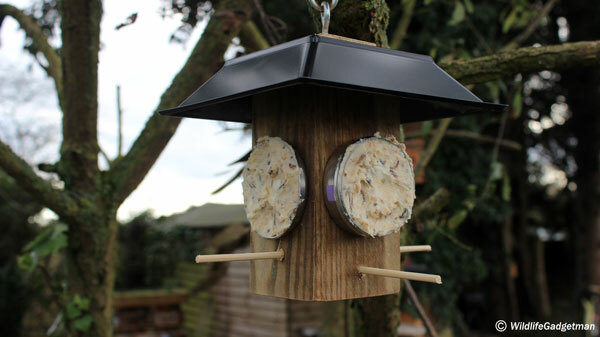 Now all that’s left to do is hang your new feeder in the garden and wait for the birds to arrive! As always I would love to hear your stories and see your creations too! 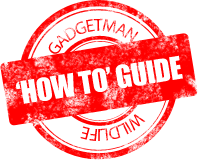 Feel free to add comments below or share via my Facebook page or Twitter! Have fun!